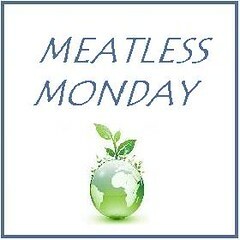 You are currently browsing the tag archive for the ‘meatlessmonday’ tag. One of my reasons for joining VeganMoFo is that I seem to have lost my appetite for cooking and blogging. VeganMoFo combines the two and may be just the thing to get my mojo back! 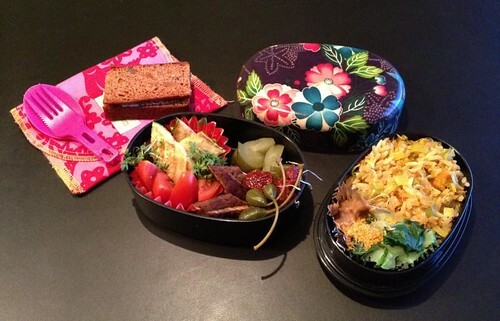 The same goes for bentoing… Might this bento be a whole new beginning and not just the start of a new week??? 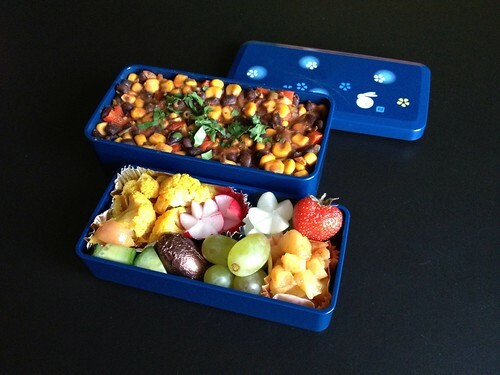 “A Meatless Monday VeganMoFo Bento” — now THAT’s a mouthful! And a tasty one as well haha (yup, bad joke). A lunch that I happily dug into during my break. Pasta salad (chilli pasta with sundried tomatoes, spring onion, black kalamata olives, parsley and a pesto vinaigrette) on iceberg lettuce. Corn cob (freezer stash), cherry tomatoes, cucumber, bell pepper and radish to dip with houmous. Houmous in the small container, carrots and two sandwiches with apple butter that are not shown in this picture because they were not in the box but in snacktaxi baggies. What did YOU have for lunch on this VeganMoFo Meatless Monday? Have you ever made a bento? VeganMoFo brings you a Month of Vegan Food. Bloggers all around the world share their favourite recipes, mouthwatering food pics, quick cooking tips, nutritional info and anything else food related to show that vegan living is awesome. It’s the best choice for animals (dûh), our planet and people! Check out the blogroll and drool… Or better yet: join us! 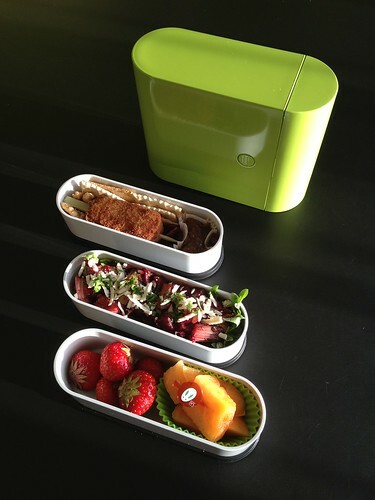 Ergo: meet today’s office lunch — my easy summer meal bento! Leftover gado-gado with tofu, bawang goreng and pickled white onions. Emping, summer fruit harvested on my own balcony: strawberries and raspberries. Fresh basil for colour. Leftover pickled salad (not shown) and an apple. Shabby seems to be my new style.. :\ That’s because I’ve been lacking inspiration to make bentos. Not only that; I rarely feel like doing anything food-related lately. Uhm except eating of course. O_o I hope it’s just a phase that will pass soon! 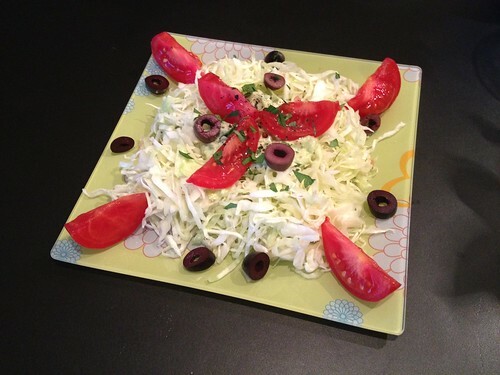 Once upon a time… I promised you a category on Graasland intended for Cabbage Recipes. It did appear, but fell into a slumber after I’d only shared three dishes with you. Well, now’s the right season to revive it! Here’s a vegan version of coleslaw that I adapted from the Dutch vegetarian cookbook Gezond genieten: Groentegerechten by Jan & Ineke Stevens. This salad is a kind of tsukemono (preserved vegetable) recipe, so it holds well and is perfect for travelling, like in this Goodbye Bento. Put the cabbage in a bowl, scatter some salt over it and weigh it down with a pan filled with water, supported by a saucer. Let it rest for a while until water comes out, preferably for a few hours. To make the dressing, scoop out the avocado, slice the green part of the spring onion in rings and put these aside. Chop the rest of the onion in small pieces and blend with avocado, cilantro, lemon juice, veganaise (or substitute). Add pepper to taste but refrain from adding salt until you’ve tasted the cabbage in step 3! Put the cabbage in a sieve, rinse and drain, pressing out excess water by hand. Now taste! Decide whether your dressing needs any more salt – if so, add it. NOTE: if you do not intend to eat all of the coleslaw at once, just drain the cabbage you’re reserving and put it in a Tupperware box in the fridge. Only rinse and wring the veg when you’re ready to use it. Place the cabbage on a nice plate or in a salad bowl, spoon the dressing in the middle and sprinkle the remaining onion rings on top. As you can see I added some tomato and olives to the salad last time. Possibly it’s better without to let the smooth avocado dressing come to its full advantage. c) elaborate — involving making your own curry paste from scratch. I’m a medium-sized grrl. ;) So here’s version B! Preheat oven to 225 °C (gas 5). Cut the carrot into 1 cm pieces. 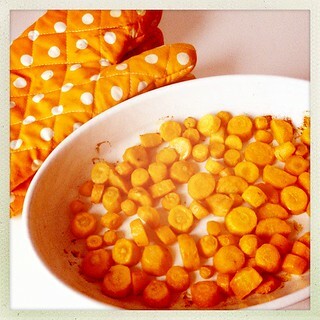 Put them in a casserole with 1 tbs of oil and mix until all the carrot is coated with oil. Put it in the oven for about 25-35 minutes or until tender. In the meantime chop the onion. When the carrots are done, heat the left over oil in a pan. Bake onion, crushed garlic and curry paste for a few minutes until soft. Add carrots, stock and coconut milk, bring to a boil and quietly simmer for 10 minutes. Remove from heat and blend to a smooth consistency. Add salt and pepper to taste, plus lime juice if using. Garnish soup in bowls with chopped cilantro. This is one of the favourite dishes on our rotation scheme. 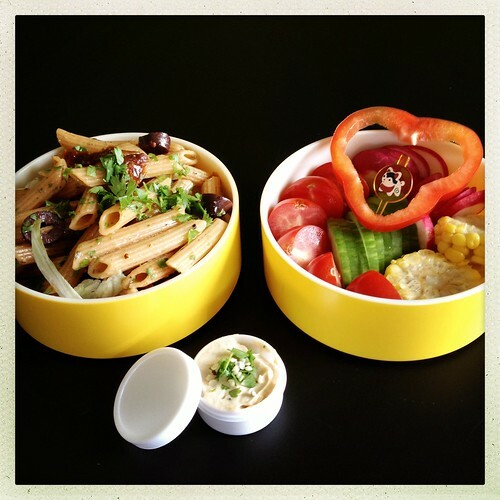 It’s great for bento too, as it can be eaten on room temperature or chilled. If you plan to eat it cold I advise you to add some more broth as the colder the soup, the thicker it is. 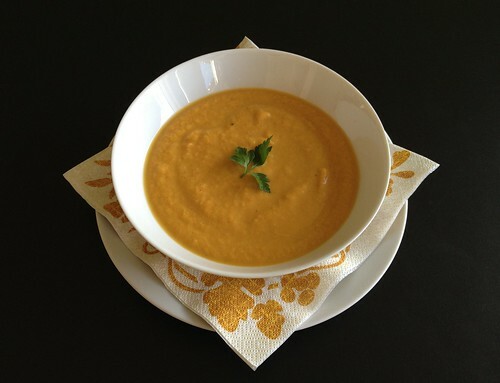 I hope you’ll like this Thai carrot soup too! Ready? Set.. Go! It’s VeganMoFo! Have you heard of VeganMoFo yet? It’s October turned into a vegan treasure box! During the month 500+ bloggers around the world will highlight the wonders of a vegan lifestyle. Nuts are packed with unsaturated (= good) fats, protein & fibres, which make you feel satisfied quickly — and it’ll last for a while. In my experience some dried fruits have the same effect. Now if you’re worried about the calorie intake… You shouldn’t! Nuts are really good for you. Unsaturated fats actually help balance your cholesterol and protect against hart disease. Nuts also contain plenty of vitamins & minerals like iron, zinc, magnesium, omega-3, calcium, phosphor, vitamins A, B, E and more. And hey, hiking = burning calories anyway! Of course not all nuts are good for you, just unroasted and unsalted ones like, for example, almonds, walnuts and cashews. Still, sometimes I bring some of the ‘bad’ ones as well. A grrl can have a treat, can’t she? 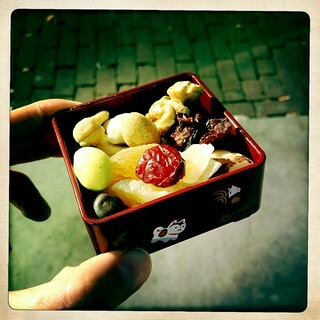 ;) Yesterday there were a few (salted) rosemary-garlic cashews and cocktail nuts in my little box among more healthy goodies like died cranberries, apricot and apple, candied pineapple, walnuts and Brazil nuts. I hope all this talk didn’t make you go nuts? Bento! A great beginning of the week as I missed out on one last week. So what’s for lunch this Meatless Monday? Rhubarb! Tofu kabob with rhubarb chutney, cranberries, crackers and walnuts. Beetroot-rhubarb salad on frisée lettuce. The beetroot salad, tofu kabob and rhubarb chutney are leftovers from last night’s dinner. Today’s small Meatless Monday bento, next to which I had two houmous-cucumber sandwiches providing the necessary carbs in my lunch. All on a bed of lettuce. A lunch like this is a good start of the week! 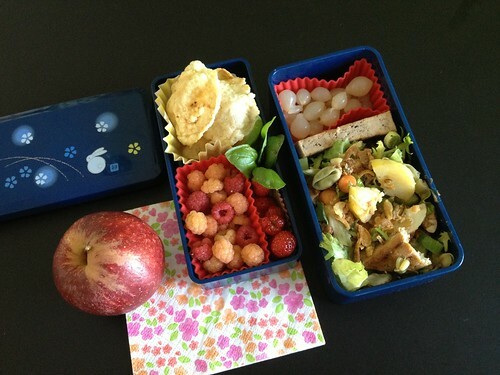 This week’s Meatless Monday Bento was chock-full of leftovers again. and a strawberry especially saved for the occassion. 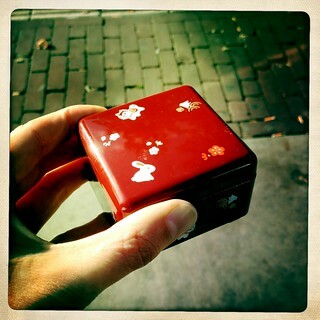 Yay, number 180: the last of my bento backlog! Now I’ve only got today’s Meatless Monday Bento left to blog, which hasn’t been assembled yet at the time of writing this post (in the weekend). Nasi goreng, braised pak choy, peanut sauce and serundeng. Grilled courgette, plum tomato, garden cress, pickles, tempeh bacon, dried cranberries and a salad corner with alfalfa, sundried tomato and caper berries. the all familiar buttered gingerbread with agave syrup for a moment of sweetness. Not shown: a country cookie to have with tea, when the others were having cake. 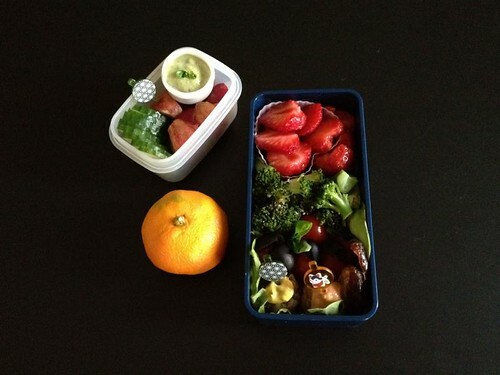 It feels really good to be up-to-date again with my bento posts! I hope I haven’t bored you? Hello, have you missed me? I’m glad to be back on this Meatless Monday ~ or Plantaardig Maandag in Dutch. 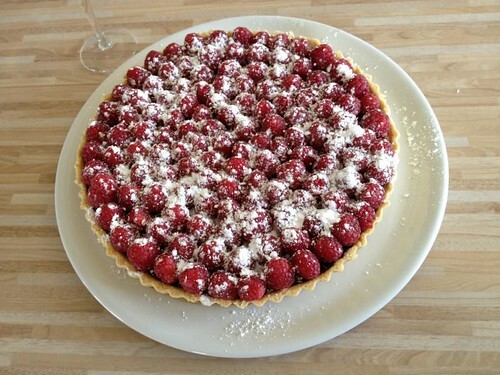 :) And even though I have a backlog of three bentos to post, I’m going to share a slice of the luxurious raspberry-chocolate pie I made for Easter! It’s so good I will definitely make this over and over again! 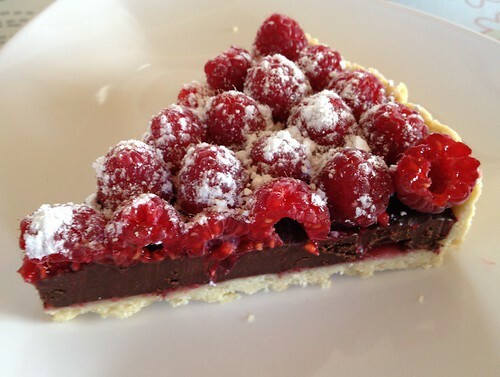 Mind you, I’m not even that much of a chocolate lover… But the flavours of this torte complement each other so well: a sugarless cake bottom with bitter-sweet (FairTrade) chocolate and the tartness of fresh raspberries. Need I say more? YUM! 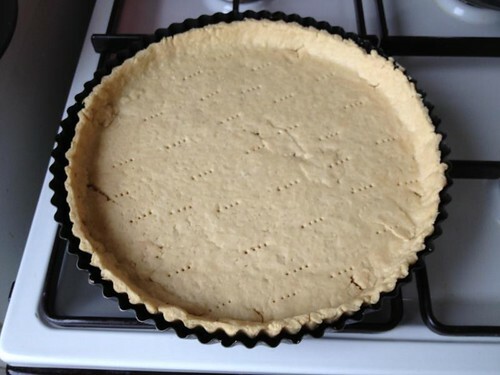 Now the baking of this pie does take a bit of patience… It’s not a lot of work (! ), but there’s waiting time in between stages. Personally, I rather saw that as an advantage! I made the cake, which is the most time-consuming part, the night before (or actually 2 ;), the chocolate filling on Easter morning and I added the topping -raspberries and powdered sugar- just before serving at teatime. That was a fun job to do with our little helper cousin. Dutch translation at the bottom of this post. Can be made up to 2 days in advance. Grease a 25 cm pastry tin and/or cover the bottom with baking paper. Mix flour, salt and ‘butter’ (125 g) by hand to make a crumbly pastry dough. Add soy milk spoon by spoon until the mixture holds together well, like shortbread dough. Roll out pastry dough, forming a circle big enough to cover bottom and sides of your pastry tin. I cover my working counter with a flexible silicon baking sheet, put the dough on, cover with baking paper and use my rolling pin over that. Press well into the sides: you can use a bit of the dough in cling-wrap to do this easily. Cut off any extra dough. Use a fork to make holes in the bottom and put the dough into the refrigerator until it feels firm. This takes at least 30 minutes – I just went out to do my holiday grocery shopping. :) You can put it in the fridge if you’re pressed for time. Cover the pastry dough with a little baking paper (recycle the piece you used for rolling the dough) and fill with pie weights or whatever you use for blind baking. Prebake in the oven for 25-30 minutes: keep a close eye on from 15 minutes onwards. Remove weights and paper and bake for another 15 minutes until light golden. Take from the oven and let it cool. Melt the chocolate Bain-Marie on low temperature (you know how to do this, right?). Add butter bit by bit (keep stirring to mix well), vanilla soy milk and maple syrup. It may seem that the chocolate is forming clumps but everything will be all right if you keep stirring carefully. 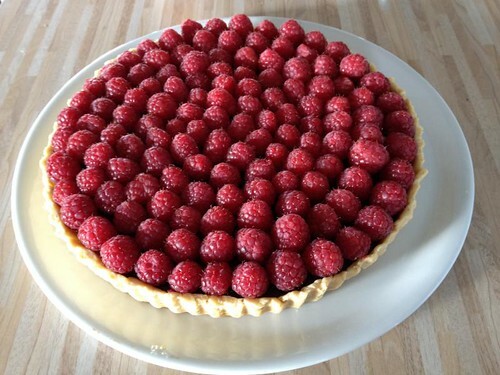 Cover the bottom of the pie with raspberry jelly. Let it cool at room temp for approximately 2 hours (or more). When you’re ready to eat you can layer the chocolate with fresh raspberries.